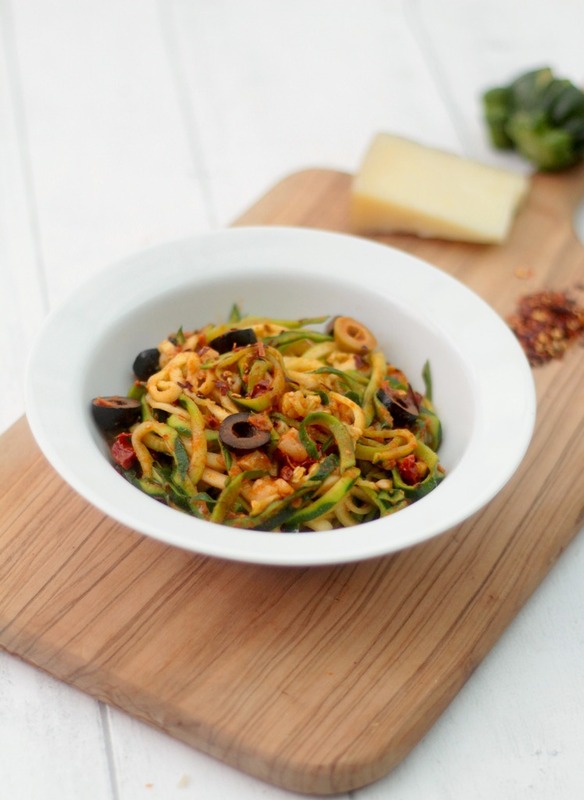 I devised this courgetti recipe after AO.com challenged me to make a healthy but exciting dish using the Kenwood Electric Spiralizer. My husband isn't a fan of having a meat free dish, and when I told him that it would also be pasta free he was even less pleased! He was worried that courgetti just wouldn't cut it. Luckily, by using some of his favourite flavours, I soon changed his mind. The biggest tip I have for using the machine is to make sure your vegetables are fresh and as straight as possible. Results aren't great if the vegetables have been sitting around for a while. The spiralizer is easy to clean with the detachable parts being dishwasher safe. Steam in the microwave for 2-3minutes. Add the pesto and garlic to a frying pan and heat through. Add the Olives and sundried tomatoes. Add the courgetti and make sure that it is coasted in the pesto. Add the small cubes of manchego cheese. Divide between 2 bowls and top with some chilli flakes. This meal was delicious and both my husband and I are looking forward to trying some more healthy meals with it. Do you have a spiralizer? What recipes do you recommend? How do you get the courgette to go through the Spiralizer? I have this machine and it does not work at all well with courgettes?